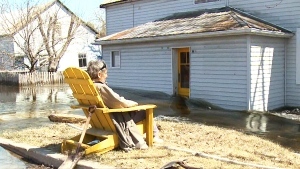 An Ottawa woman says she hasn't left her home in weeks because the sidewalks are just too dangerous. "The way the sidewalks are plowed, the streets are plowed, I can't get around," said Ogden. "The sidewalks are a disgrace." Lorraine Ogden was confined to a wheelchair after losing both her legs to an infection in 2016. Her first winter in a wheelchair, Ogden says she got stuck in the snow. "The sidewalks were only plowed half and I couldn't ride on the road," said Ogden. "I got stuck, I started freaking out." Since then Ogden doesn't venture out during the winter season. "It does drive me crazy," said Ogden. "Everyone asks my sister, is Lorraine okay, because they don't see me." "It was devastating," said Jane Ogden, Lorraine Ogden's sister and caregiver. "It breaks my heart to see she won't go out because she's terrified." Ogden is raising the issue for anyone with a mobility issue. "It's not right for people in a wheelchair, but not just myself, the seniors too," said Ogden. "The streets are terrible, they're not plowed properly." The City of Ottawa says they have crews out 24 hours a day and are doing the best they can in what's been a uniquely challenging winter. "Over the last three weeks we've definitely have had some challenging weather with a lot of deep cold, heavy snowfall, mixed with freezing rain and rain," said Bryden Denyes, Program Manager and Operations Planning for the City of Ottawa. "Those definitely post operational challenges for us." "We're out on the sidewalks daytime and nightime trying to achieve our service level in our maintenance quality standards." "We're doing our best to help all pedestrians," said Denyes. "Whether they have mobility assisted devices or just walking to try to allow them to freely move during snowstorms and after the snowstorms." The Ogdens say they have raised their concerns with the city but say the work done still isn't enough to guarantee a safe journey for someone in a wheelchair.